Twenty-five lives are at stake. In less than a week, #OpFOQ has learned more than any other interested party has learned about two dozen hostages kidnapped in December 2015 in Iraq in more than eleven months. #OpFOQ is a campaign to focus attention on this mass kidnapping, to force the government of Iran to divulge what it knows about the whereabouts and health of the Qatari hostages, and to earn the freedom of the hostages. On March 27, #OpFOQ learned that at least one of the hostages is still alive and published this information along with a photograph. This represented the first break in the case since two hostages were freed in April 2016. On March 29, the #OpFOQ campaign published a Tweet without clarification that further established that it is acquiring information about the hostage situation. It read: “We have learned of a persistent rumor that a Qatari national maybe behind the kidnappings. Our intel suggest this is entirely false.” No further comment has been posted on Twitter and no elaboration has been publicly offered to journalists. #OpFOQ’s success thus far has whetted the appetites of the families of the hostages for more information, whetted their appetites sufficiently to financially support a tip line through a reputable whistleblower organization’s service. The tip line can only be used through the Tor browser, to ensure secure communications. (Any other web browser will display an error page. Tor employs a random global network of relays to anonymize parties at both ends of a network.) 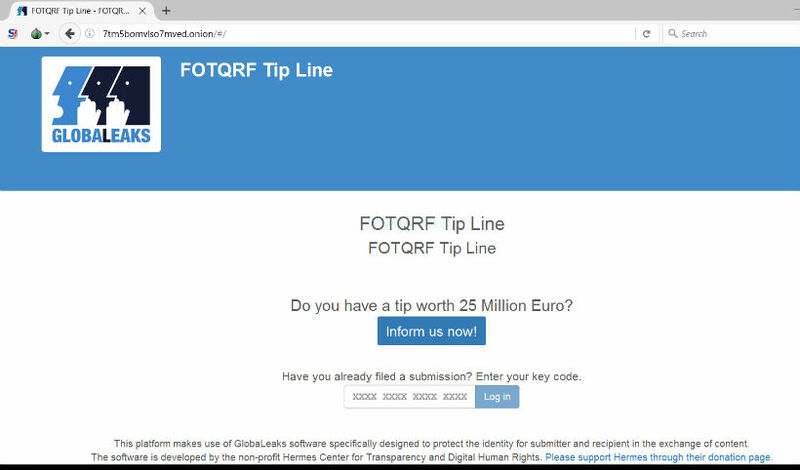 Software developed by the Hermes Center for Transparency and Digital Human Rights called GlobaLeaks is employed for the tip line. As of March 30, #OpFOQ has not made public any communications received via the tip line, or even whether any parties have attempted to use the tip line’s web site. The “FOTQRF Tip Line” asks the question: “Do you have a tip worth 25 million euros?” No other statement follows. It does not describe what sort of information might be worth that amount or even who might be interested in paying “up to” that amount. One either knows something or one does not. It does not identify the reason for the tip line’s existence. There are twenty-five hostages, all of them Qatari nationals, several of them members of Qatar’s ruling royal family, the Al Thani family. Thus, there may be as many as twenty-five families who are interested in information about their loved ones. The Qataris and several other nationals were kidnapped in December 2015, and since April 2016, when two of the hostages were freed, the missing men have been absent from the world’s headlines and attention as well, despite the fact that a handful of the hostages are members of the royal family of Qatar. Families are missing sons, brothers, husbands, fathers. The men were not taken by an official government entity, so groups such as Amnesty International and Human Rights Watch have been bystanders as the mystery deepened each day. Thus, a large falconry party of twenty-seven men and the birds they were training seen in that part of the world in December is nothing out of the ordinary. What followed was. Al Muthanna is desert, sparsely populated, and only nominally governed by the politicians in Baghdad. The Imam al-Ali Brigade of the Asa’ib Ahl al-Haq, an Iran-backed Shi’a paramilitary force, controls much of the desert region of southern and western Iraq, where the kidnapping took place. Between 2:00 and 3:00 a.m. on the night of December 16, 2015, while the group slept, a convoy of about 100 armed men in pickup trucks and vans descended on the hunting party’s camp, near Busaya in the Samawa desert, and took the entire group hostage. Not a shot was fired. The hunters who were taken hostage were almost all from Qatar, among them six members of the Qatari royal family, the Al Thani family. The fate of the falcons remains unknown. No group claimed responsibility in the immediate aftermath of the kidnapping, and nine hostages were released or escaped within days—one Kuwaiti, two Saudis and six Qataris. None of the nine were members of the ruling Al Thani family of Qatar; all were servants of or helpers to the falconry party. Ransom notes have appeared in the Iraqi media every so often, but their veracity is usually questioned. It appears that the hostages are to be used as “bargaining chips in negotiations to secure the release detainees held by armed factions in Syria,” but the incident took place fifteen months ago. It is believed that the hostages may be held in small groups scattered among small villages near Basra, Iraq. Since the night of the kidnapping, December 16, 2015, only two hostages have been released: one member of the Al Thani family and a Pakistani aide who were both freed in April 2016. It is not known where the remaining hostages are being kept, or even if all twenty-five are still alive. They may be held in various Iraqi prisons. Qatar’s government has attempted negotiations with Iraq’s government, but neither entity has the ear or allegiance of the group or groups that took the falconers hostage. Iran probably does. The annual conference of the Arab League, the Arab Summit, was held this week in Amman, Jordan, and concluded yesterday, March 29. #OpFOQ was launched on March 24 to direct the conference attendees’ attention to this mass kidnapping and ultimately to earn the freedom of the two dozen Qataris held against their will in Iraq. A media campaign centered on the #OpFOQ Twitter account, which has been seen tens of millions of times since its launch last week. #OpFOQ’s campaign for their freedom will continue around the clock.